Dr Edward Page has written an expert comment on the recent global school climate strikes for Politics Reconsidered. Across Sweden, and in over 120 countries, the climate strikers spoke of their hopes and fears and endorsed a range of policy measures and behavioral changes that older generations had resisted: higher taxes for petrol and aviation fuel, fewer trips by plane, phasing out of one-time plastics, and a reduction in meat consumption were all championed. At partner events in Australia, other children demanded a moratorium on new coal-mines and natural gas projects, as well as renewable only energy production by 2030. Writing in The Guardian, Thunberg and others explained that ‘these strikes are happening today… because politicians have failed us. We’ve seen years of negotiations, pathetic deals on climate change, fossil fuel companies being given free rein to carve open our lands, drill beneath our soils and burn away our futures for profit...Politicians have known the truth about climate change and they’ve willingly handed over our future to profiteers whose search for quick cash threatens our very existence’ (Thunberg et al 2019). Two of the most striking elements of the protests were, first, the diverse but eminently achievable measures that many of the schoolchildren demanded (reductions of meat consumption, decreased use of consumer plastics, shift to renewables, and reduces use of carbon intense energy, are all eminently achievable and have been promoted by many environmental groups and green political parties, if with very limited success; and, second, the focus on the ‘existential crisis’ caused by an inadequate climate response run by, of, and seemingly for, older generations who will not face the consequences of their failure. Gary Goertz, Professor at the Kroc Institute for International Peace Studies, University of Notre Dame, is visiting Warwick on 13 March, 2019. Prof. Goertz is a highly influential scholar on issues of conceptual development, causal mechanisms and multi-methods research. Professor Goertz will present work from his forthcoming, completely revised book, Social Science Concepts: A User’s Guide. Earlier versions of this book have served as a touchstone for students of political science and social sciences more broadly. Professor Goertz will give a small workshop with faculty (including post-docs) and Ph.D. students (2:00-3:30, Ramphal Building, R0.03 on “Guidelines for Constructing and Evaluating Complex Concepts”), and present at the closing session of the Politics and International Studies Department seminar for term 2 (4:00 – 5:30 pm. Ramphal building R0.03 on "Three Schools of Conceptualization and Measurement: with Applications to Global Indicators such as related to Poverty and Human Well-being"). Interested colleagues are invited to write to the co-organizers Tom Long t.long.1@warwick.ac.uk and Maria Koinova m.koinova@warwick.ac.uk to RSVP and for further information. A flyer of Prof. Goertz talk at 4 pm. is attached here. We are delighted that the PAIS Department is a case study in the Warwick Education Strategy, launched today, for our No 1 position in the Russell Group for overall student satisfaction, as reflected in the National Student Survey (NSS). The UK Parliament has emerged as a key veto player in the Brexit process. But away from the headlines over Parliament's 'meaningful vote' on the Brexit deal, it has also played an important role in day-to-day scrutiny of the Government through the work of its cross-party committees. In this talk, Joanna Welham, the Clerk of the House of Commons International Trade Select Committee (the Committee's chief civil servant), will be speaking about the role of Select Committees in holding the Government to account - and reflect on the role of expertise in shaping their work. 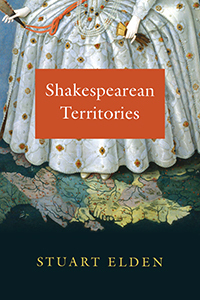 Stuart Elden’s book Shakespearean Territories was published in late 2018 by University of Chicago Press. The book uses readings of a number of Shakespeare’s plays to explore different aspects of territory. Shakespeare’s plays explore many territorial themes: from the division of the kingdom in King Lear, to the relations among Denmark, Norway, and Poland in Hamlet, to questions of disputed land and the politics of banishment in Richard II. Shakespeare dramatized a world of technological advances in measuring, navigation, cartography, and surveying, and his plays open up important ways of thinking about strategy, economy, the law, and colonialism, providing critical insight into a significant juncture in history. The book explores how Shakespeare can be read as developing a nuanced understanding of the complicated concept and practice of territory and, more broadly, the political-geographical relations between people, power, and place.